That’s not how it went down for Karman Singh Grewal, 25, Manbir Singh Grewal, 28, Ibrahim Amjed Ibrahim, 29, Indervir Singh Johal, 23, and Harmeet Singh Sanghera, 23, this week. 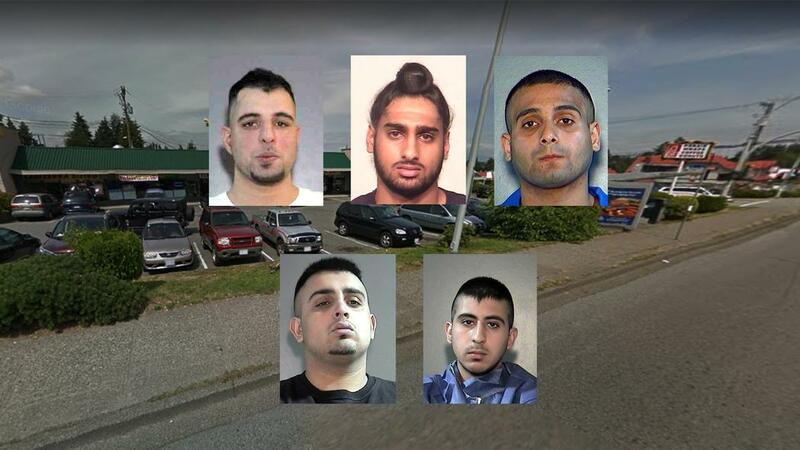 The five men were named by Surrey RCMP late Monday as “five individuals who have been the targets of shots fired incidents over the past two months.” According to the cops, they’ve all refused to make statements to police, and are therefore a risk to public safety. In a statement the RCMP acknowledged the 20-somethings’ “lives are in danger” but because they haven’t cooperated on investigations, their names, photos and victim status are now on blast. British Columbia’s Lower Mainland has been experiencing an “uptick” in gang shootings this summer, according to police. There were six incidents in July, which is actually a 47 percent drop over the same time last year. Like many conflicts before it, this one is believed to be over the drug trade, crossing between Vancouver, Surrey, Abbotsford and as far east as Chilliwack, BC. Despite cooperation from the province’s anti-gang unit, the intel on the case has apparently been coming in slow. Micheal Vonn, policy director at the BC Civil Liberties Association, said the disclosure of victim information was “shocking.” It’s really uncommon for police to name people without charges, especially if they’ve recently dodged a hail of bullets. It’s not clear whether any of the men were injured in the shootings. Vonn says under Canada’s privacy laws, police would need to apply discretion to one of a few exemptions to justify the disclosure, but it’s not clear which exemption they’re using in this case. “It’s a controversial enough a use of discretion that I would think a consultation with BC’s privacy commissioner would be appropriate,” she told VICE. Publicly shaming alleged gangsters this way is an uncommon approach, but it’s not totally unheard of. Back in 2015, I wrote about another spate of drive-bys in the area that pushed police to release names “in connection” with the shootings before charges were laid. At the time, long-time anti-gang advocate and filmmaker Mani Amar told me the intention is to put pressure on families to come forward with information. “Releasing names ostracizes them in the community—shows their extended families, classmates, college teachers and whoever might know them what they’re up to,” Amar told VICE. “I’m seeing a pattern in these photos…. can’t kill them twice so when they’re dead the shooting stops…. Just sayin,” reads one tweet. “The immigration of people from India has created this problem. Surrey has become a threat to the residents and police who protect,” reads another. No matter their tactics, cops could have more support from the province’s new NDP government soon. In an interview with BC gang reporter Kim Bolan, the incoming solicitor general said they plan to listen to cities’ concerns and make gang violence a priority.